Embark on a private boat charter adventure from West Oahu along the Waianae Coast, where you can snorkel with dolphins & create the perfect group getaway for up to 38 people! The Waianae Coast, along Oahu's west side, is renowned for clear waters that reveal sea life teeming beneath the surface, most famous of which are the pods of Hawaiian spinner dolphins that frequently appear in the area, breaking the waterline to splash along passing boats. This area is popular for snorkeling, as it offers some of the island's best chances for marine life encounters. Reasonably priced private charters are an excellent choice for guests travelling in groups. Swimming, snorkeling & simple cruise options are all available at a great flat rate. Bring snacks with you - There won't be many chances to pick things up along the way, and there aren't many shops around the harbor. Use the bathroom before you leave - The boat does not have restrooms on board. Talk to the crew and let them know your interests - Once the crew knows what kind of experience you're after, they can help you have the perfect day on the water. After a drive to the west side of Oahu, prepare for departure from Waianae Harbor for a spectacular private cruise. The captain will go at your pace and point out coastal landmarks and sea life (including bounding spinner dolphins)! When you find a good spot, feel free to jump in the water. This is a totally private tour, so feel free to get in and out as often as you'd like. The captain and crew will get you fitted with snorkeling gear to use all day. Watch for reef fish and other sea life encounters! 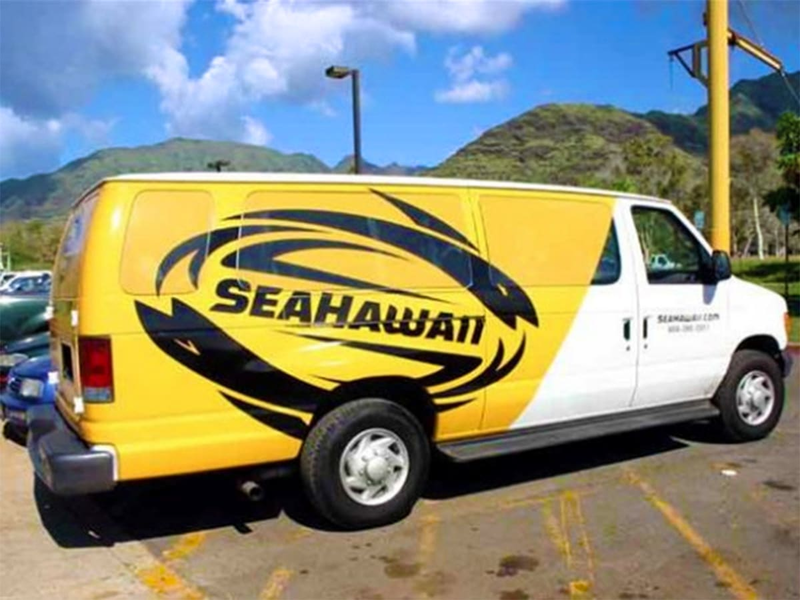 Look for a yellow and white Sea Hawaii van. There are no restrooms available aboard the boat. Are prescription snorkel masks available? Yes, there are some prescription snorkel masks available, but lens strengths vary and not all participants may find a perfect match. Guests are always welcome to call ahead to check on prescription mask availability. Yes, you may bring any food and soft drinks you wish to eat on the tour. However, coolers are not allowed on board. Alcoholic beverages are not permitted. The rules outlined in the cancellation policy also apply to booking changes (including changes to the number of participants or date of tour).